It may sound ludicrous to the uninitiated homebuyer, but your buildings inspector won’t take a glance at the chimney in the property you’re interested in. Instead, it’s ‘caveat emptor’, or ‘buyer beware’ where this major part of the home is concerned. Of course, they might suspect problems, but the fact is that you need a specialist chimney sweep to inspect the chimney thoroughly before any house purchase. This month, London Chimney Sweeps are telling you why a chimney inspection by a HETAS approved sweeper is a great investment in the safety of your new property. The first step is to ask the seller if the property comes with a valid certificate of sweeping. This certificate should show when the chimney was last swept, inspected and its absence will flag up that the chimney hasn’t been tended to by a professional in some time. Often a neglected chimney will throw a number of curve balls your way. They won’t be too hard to put right but will require the specialist equipment and knowledge provided by a HETAS sweeper. Birds nests and carbon monoxide poisoning are just some of the issues faced by properties with neglected chimneys. Arrange to have the property surveyed by a dedicated chimney expert before making any offer. If you have already agreed a purchase, then request the chimney to be inspected before the deal is completed. This will give you chance to renegotiate with the seller, should any major problems be found. 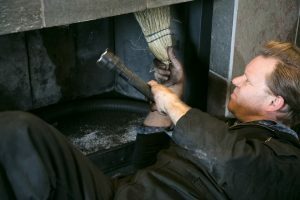 Modern sweeping techniques go beyond the brushes and sheets of yesteryear and there are now sophisticated processes to assess chimney damage from the safety of the fireplace. Using CCTV equipment, modern chimney sweeps are able to survey your chimney with pinpoint accuracy to clean out any niggles. After a thorough sweep, a home can be furnished with a certificate of sweeping. This is one way to avoid being one of the many over-eager buyers who purchase a property with an average of £4000 in repairs required in the first year of ownership. The London Chimney Sweeps is the premier provider of sweeps in the capital. We’re a HETAS approved company with many decades of combined experience to put you at ease that our services are straightforward, professional and prompt. We even guarantee minimal mess and disruption to your home while we work. It’s an essential service for a safe home with a traditional fireplace or woodburner and with The London Chimney Sweeps you can be assured of top tier services from an industry expert. For more information, contact us today.